Here’s a look back at some of the things that immediately come to mind as I ponder about what was in 2012 and also take a look ahead at what might be in 2013. 2012 Flashback: As most of the people who would be reading this already know, I started a new job with Desire2Learn back in May, 2012. It’s been just over 7 months now, and I’m still very glad that I made the move to a corporate position after 27 years on the inside of higher ed. 2013 Flashforward: The company (D2L) is doing great. They treat employees exceptionally well, and the future is definitely very bright. I certainly hope that I continue to fit into their plans. 2013 Resolution: do my best to not screw up the great job that dropped into my lap. You can view some of my work at the Desire2Learn Community. Sad memory of 2012: There are many to choose from, but I’ll go with this one: Minnesotans and Wisconsinites engaged in wolf hunts, with a majority of the wolf “trophies” being taken by leg traps. This previously endangered species was brought back from the edge of extinction so that they can be killed by humans, apparently. Next up? I think we’re seeing a few too many bald eagles around these days – better shoot ’em! Happy memory of 2012: I developed a passion for growing vegetables, both indoors and out. Right now while it’s below zero (F) outside, I have tomatoes that are ripening in my little indoor greenhouse. I have both hydroponics and soil-based plants growing in what was formerly my tropical fish room. 2013 Resolution: Continue learning more about hydroponics gardening and successfully grow some of the exotic seeds that I am finding online. 2012 Flashback: As a result of taking the job at D2L, I am no longer pursuing any new business with Excellence in e-Education. In fact, the website is being deleted early in January, 2013, so I won’t even bother linking to it. I have saved all webinar recordings from 2011-12 here at barrydahl.com and will continue to make them available as long as possible. I enjoyed the time I spent being self-employed and we were getting by financially; but “getting by” and “putting three kids through college” are two very different things. 2013 Flashforward: I expect to have a slightly higher blogging profile at this site during 2013. Eliminating the Excellence site helps take one thing off my plate. 2013 Resolution: engage in more long posts and less 140-character posts when the long post is more appropriate. 2012 Flashback: A definite highlight of my year was a trip to Australia in September for the first annual Desire2Learn Asia-Pac Teaching and Learning Conference. 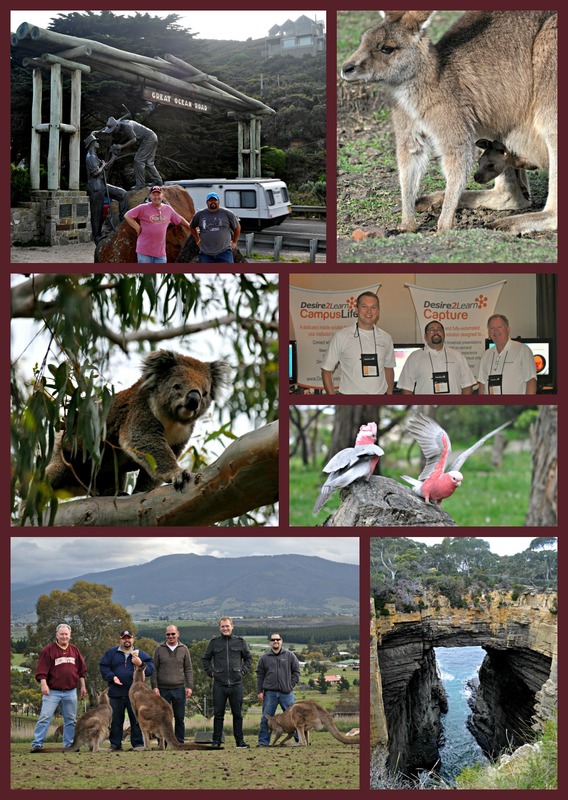 This was my first trip to Australia and I was able to make the most of it by adding on a few personal days both before and after the conference in Melbourne. Spent two days driving the Great Ocean Road, went to a Footy game in Melbourne, spent two days in Hobart, Tasmania and visited the fine folks at UTAS, and then wrapped up with two days in Sidney. 2013 Flashforward: I’ll probably be travelling quite a bit in 2013 as well, but it’s unlikely that I’ll have the opportunity to go anywhere as exotic as Australia. Still, I generally enjoy travelling and plan to make the most of several trips by mixing in some personal days along with the work days. Currently looking forward to work-related travels to Ontario, Alberta, Manitoba, Illinois, Georgia, Florida, Michigan, Massachusetts, Oklahoma, Colorado, California, South Carolina, and probably a few others that I don’t know about just yet. This next one is more for me personally, since I’m more likely to accomplish something that I write down and/or declare to the world. 2012 Flashback: After returning from Australia, I took a chance on chiropractic care for the first time in my life. I was having periodic (and worsening) issues with my lower back and finally agreed to have it looked at. The x-rays showed that I have a deteriorating disc at the bottom of my spine, between L5 and S1, in particular. I have a couple of family members who are chiropractors, but still wasn’t sure that this would be the path to improvement. Turns out that it was exactly what I needed. It’s not as if the disc is miraculously growing back (it won’t), but I certainly am living with less pain these days. 2013 Flashforward: Between periodic adjustments, regular stretching, and use of my new inversion table; I plan to stand straighter and be less whiny. 2013 Resolution: I plan to visit the Y at least 100 times in 2013 for stretching and exercise, and to use the inversion table at least 100 times on other days. I’m a numbers person and highly competitive, so having a goal and a calendar taped to my mirror just might be the ticket. In case you haven’t heard this next little tidbit, let me assure you that getting old is indeed a pain in the backside.